19th April, 2013: Rolf Harris, the Australian entertainer who performed for the Queen at her Diamond Jubilee concert last year, was arrested by detectives from Scotland Yard's Operation Yewtree on March 28. 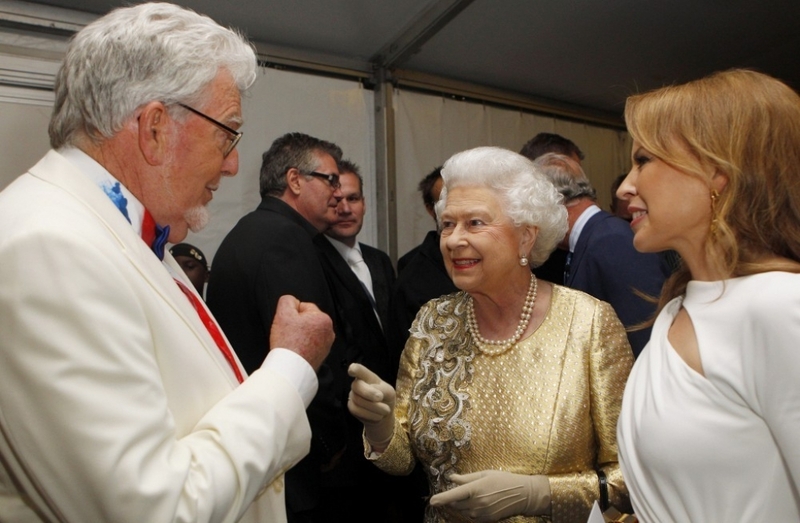 UK media did not name him for legal reasons until The Sun did so today.Here, stock image:.4th June 2012: The Diamond Jubilee Concert held at Buckingham Palace in celebration of 60 years of Queen.Elizabeth II reign.Pictured: Queen Elizabeth II meets Rolf Harris and Kylie Minogue backstage at The Diamond Jubilee Concert outside Buckingham Palace. - high-definition photo for free download.